There are some extremely Complex moral situations where hard choices had to be made. This interested me a great deal, and I won't claim to have the right decision. One example from the film is the situation with the two ferries, each with the other boat's bomb-detonator. Whichever boat squeezed the trigger first would be spared while sinking the other. The only thing I could think of in that situation was that whoever squeezes the trigger first would seem to be compromising their own morality. From a practical standpoint, this would not be the case, however. Pragmatism, as far as I can tell, would have to find a way of calculating the value of the passengers on each boat and deciding who was worth saving. One method may simply be to see how many people are on each boat; whichever boat has more occupants would be the one to save. The question is, however, would squeezing the detonating trigger be a sin? Would it be a virtuous thing to refuse to blow up the other boat in hopes that God would providentially provide a way out of the situation? I don't know, but I'm interested in your thoughts. The Joker fancies himself as Aristotle's unstoppable force and Batman as his Immovable object. Joker: "This is what happens when an unstoppable force meets an immovable object...I get the feeling that you and I are destined to do this forever!" I found this dialogue to be very rich, interesting, and rewarding from a philosophical standpoint. Neither of them is literally immovable or literally unstoppable, of course, but it provided an interesting insight into the Batman-Joker dynamic. A few minutes later [!Spoiler Alert!] in the film, Plato's concept of the "noble lie" comes to life as Batman and Gordon decide to lie about Dent and tell Gotham that he died as a hero rather than a villain. This is done in order to preserve social order and to give the city a hero who is larger and even more important to the city - in the long run - than even Batman himself. "Do I look like I have a plan? I don't have a plan. The mob has plans, the cops have plans. You know what I am, Harvey? I'm a dog chasing cars. I wouldn't know what to do if I caught one. I just do things. I'm not a schemer." "When the chips are down, these civilized people will eat each other." "Do you want to know why I use a knife? You see, guns are too fast. You can't savor all of the little...emotions. In their last moments, people show you what they’re really like. So in a sense...I knew your friends better than you did. Would you like to know which of them were cowards?" "Freak? Why don't we cut you up into little pieces and feed you to your pooches, hmm? And then we'll see how loyal a hungry dog really is!" Seeing them in print is disturbing, but hearing them roll out of Ledger's mouth is like hearing the devil himself waxing philosophical. His character is so dirty and gritty. His makeup is constantly smudging, he is clearly not afraid of death. He is evil because it just feels good (compatiblistic free-will, anyone? ); there is literally no one in the entire Batman universe who will ever be more evil, intimidating, or destructive than the Joker, and specifically as portrayed by Heath Ledger. I seriously can't see this movie ever being topped. I can't imagine what they could possibly do to better what has been done in this film, and I secretly kind of hope that they play it smart and end this era of Batman with The Dark Knight, because as far as I'm concerned, it will only be downhill from here. And while I'm at it, I wish they would have killed off The Joker simply because I hate the idea that anyone other than Heath Ledger could ever try and fill those shoes and do a lousy Heath-Ledger-as-Joker impression. I would like to applaud Christopher Nolan's vision for the Batman universe. My favorite thing about what he does with Batman is that he's stripped it of the campy quality it had during the 90s and imbued it with these gritty, realistic (as realistic as a comic-to-film adaptation can be, anyway), and down to earth qualities. 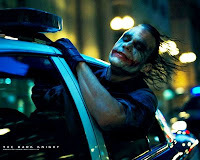 My favorite scene from The Dark Knight was the scene where The Joker is riding down the street hanging out of the back of the police cruiser with his sleeves rolled up and his face in the wind. It just had this very Michael Mann quality which I would love to see more of if Nolan continues the series. It is easily the greatest comic to film adaptation ever, and I strongly believe it will be remembered as one of the greatest films of all time - comic adaptation or not. So there you go. A film review when I promised I wouldn't do one. I am very interested in what the rest of you thought about this movie, though I've got a pretty good idea what you're going to say. Just a hunch. I've enjoyed both of Christopher Nolan's Batman movies. However, I thought that the Joker's character overshadowed Batman to the point of hurting the film. I thought the film would have been better had Batman had a stronger character in The Dark Knight. Also, I thought the story and script were not as tight as Begins. The segment with the two ferry boats at the end seemed tangental and I thought the further the movie progressed the looser the plot got. However, I thought the moral and philosophical questions brought up in the movie were great and refreshing compared to most movie dross these days. Long live Nolan and Batman! I saw Batman again to night. It is BETTER the second time! Well done Adam. Feel free to peruse my own review on my blog. When Joker does his pencil "trick" everyone in the audience just gasped-even me! They really got deep with this one. Have you seen Batman and Philosophy: The Dark Knight of the Soul yet? Looks like an interesting book. Well keep up the good work. And you'll have to explain the compatibalistic free will idea to us non-specialists. Oh come on Adam. You somehow managed to make a reference to compatibalist free will in a movie review of the Dark Knight? You've got to draw the line somewhere.